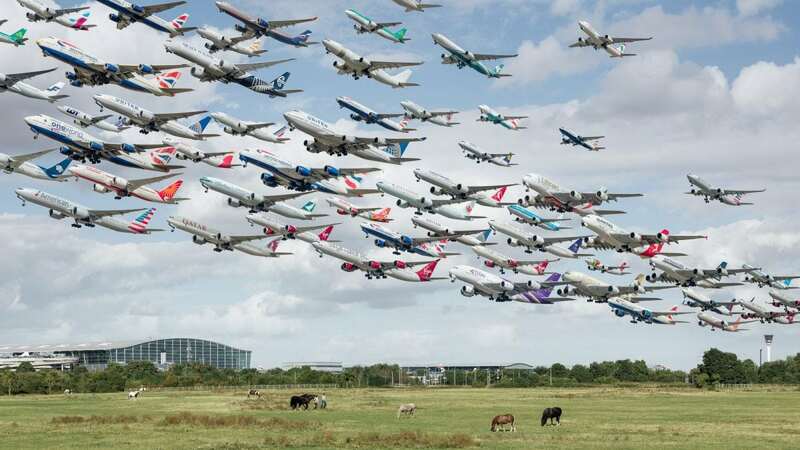 Incredible pictures of planes taking off and landing at the busiest airports in the World have been released following the announcement that Heathrow is to get a third runway. 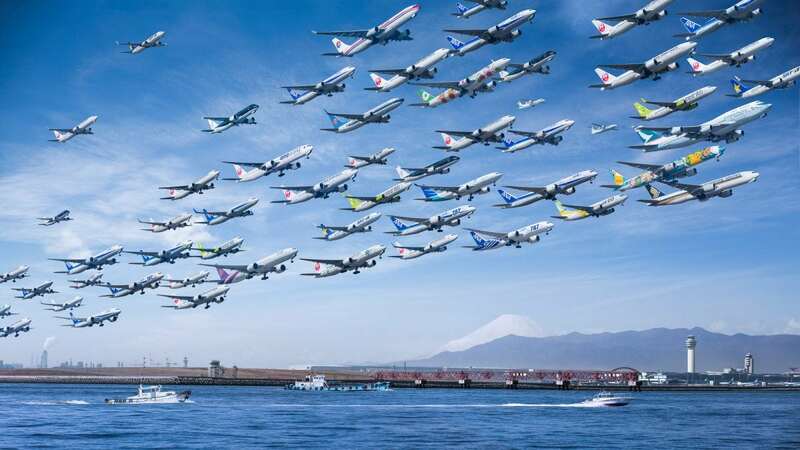 Photographer Mike Kelley has been working on the aptly-named Airportraits project for two years, taking pictures of planes taking off from runways and compiling them into impressive combined shots. Each picture shows dozens of planes either taking off or flying overhead all in one image, showcasing how busy the skies are. The architectural photographer was plane spotting at Los Angeles’ LAX airport in America in 2014 when he landed on the idea. He said: “I’ve always been fascinated by aviation and one day while out at LAX plane spotting, decided that I wanted to try capturing multiple takeoffs and putting them together into a single image to show their flight paths and the sheer volume of traffic departing LAX. 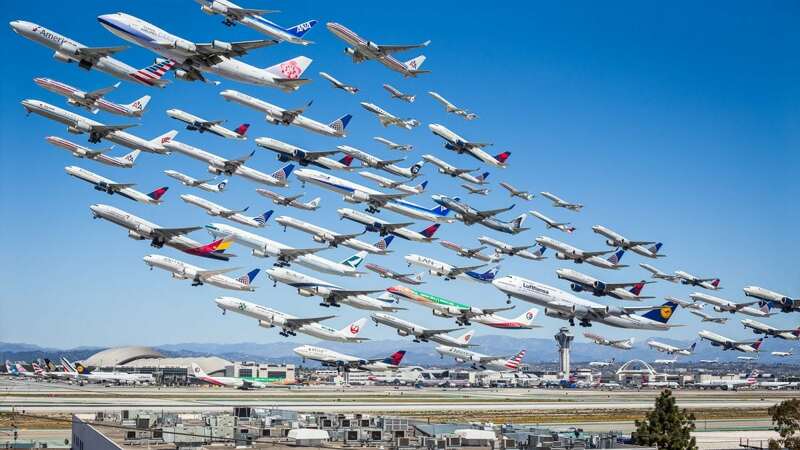 Los Angeles Airport composite by Mike Kelley. Following the success of his first picture, he set out to visit a number of famous airports to build up a library of photographs to work on. The LA-based artist said: “I mostly chose airports based on their setting or how iconic they are on a global scale. “Heathrow is obviously one of the most well-known, for better or worse, airports in the world, set in the middle of what is probably the most famous city on earth. Tokyo’s Haneda Airport composite by Mike Kelley. Mike created 22 amazing composite pictures some of which took weeks or even months to create as he had to contend with the weather and position of the sun. According to Mike the easiest place to get pictures was LAX where the weather was consistent, but other airports proved more problematic. He added: “It actually took three trips to London to get images I was happy with because the constantly shifting weather and winds. Dubai Airport composite by Mike Kelley. The Department for Transport said a new £17.6bn runway at Heathrow would bring economic benefits to passengers and the wider economy worth up to £61bn and create as many as 77,000 additional local jobs over the next 14 years. Following a public consultation MPs will vote on the move next winter and construction could start by 2020 which would see the third runway operational around 2025. 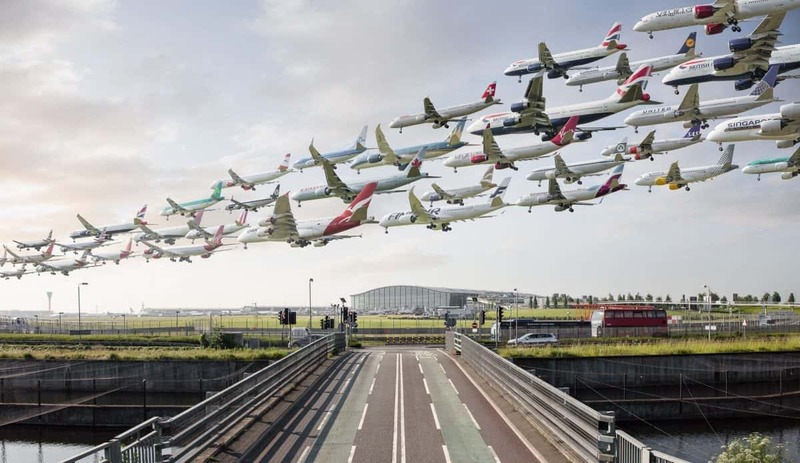 London Heathrow Airport composite by Mike Kelley.